A team of scientists from the National Oceanography Centre (NOC) will be on board to acquire data from an array of instruments in the Atlantic Ocean, between the west coast of Africa and the east coast of the USA. Currently data from these instruments, referred to collectively as the RAPID array, are gathered once every 18 months by a research ship. However, on this expedition the researchers will be testing a new system that will use marine robots to retrieve data from the instruments. 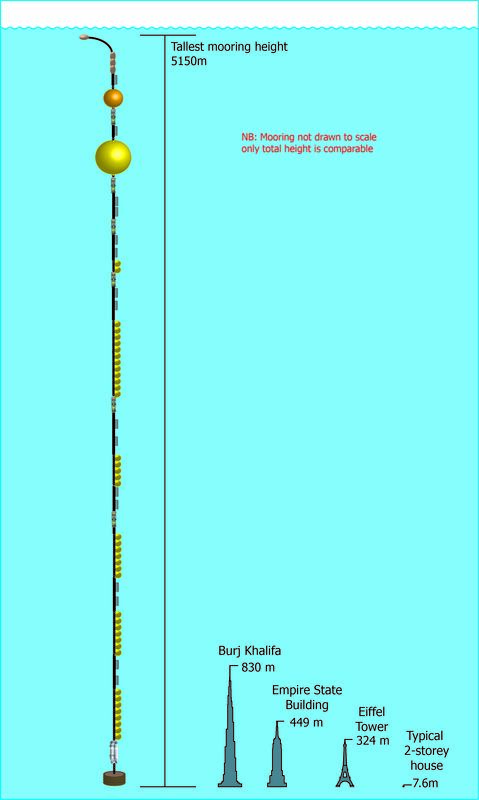 The scientific instruments that comprise the RAPID array are deployed on ‘moorings’, wires that extend from an anchor on the seafloor, sometimes more than 5km deep, to just below the sea-surface. A new unit, developed at the NOC’s laboratories in Southampton and Liverpool, will be attached to one of these moorings to gather data from all the instruments on the wire and then transmit the data using sound signals to a marine robot called a “Wave Glider” at the sea surface, which will in turn send the data by satellite to scientists at the NOC. Currently more than 200 instruments are in the water gathering data on the temperature, salinity and flow rate of a system of ocean currents sometimes described as the ‘Atlantic conveyor belt’, or the Atlantic Meridional Overturning Circulation (AMOC). AMOC is responsible for the transfer of large volumes of heat from the tropics to northwest Europe, keeping its climate relatively mild. The energy involved in this heat transfer is equivalent to 35,000 times the average rate of electricity consumption in the UK or about one million times the output of an average UK nuclear power station. The RAPID programme has been studying the AMOC for over a decade, during which it has made a number of surprising and important findings. In 2009–10 a slow-down of the AMOC caused sea levels in New York to rise by 13cm, leading to widespread flooding and erosion on a scale similar to a hurricane. RAPID data assimilated into climate models might also provide early warnings of extreme seasonal weather, such as the cold UK winters of 2009 and 2010. The NOC team have estimated that the AMOC has declined by 15% since measurements began in 2004, which has important implications for the world’s climate. Recent studies have indicated that this decline could also be one cause of the ‘cold blob’ – an area of the North Atlantic that is colder than the surrounding ocean. RAPID started in 2004 as a collaborative project between Natural Environment Research Council (NERC) in the UK, and the National Science Federation as well as the National Oceanic and Atmospheric Administration (NOAA) in the US. The project is set to continue acquiring data, as its NERC funding has been extended until 2020. The RAPID data are available online here.